If the University of Southern California Annenberg School’s Center for the Digital Future is correct, Denver likely will not have a major daily newspaper in 2017. Instead, The Denver Post will be an online property with print editions only once or twice a week. Circulation numbers are still king, of course, but here is the ranking of U.S. newspapers according to their Twitter followers (Note: it only ranks the newspapers’ primary Twitter accounts). The Denver Post ranks a very respectable eighth, although the follower numbers fall off a cliff after the top three. 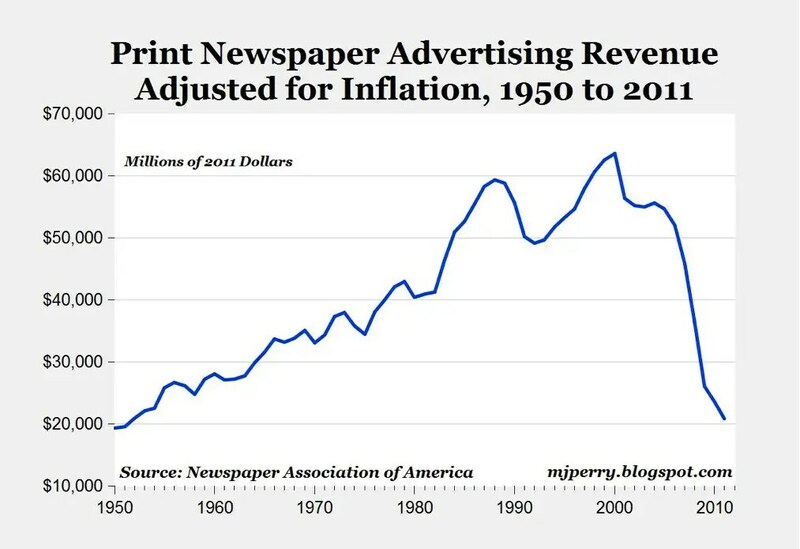 The bad news for newspapers continues. The Audit Bureau of Circulations (ABC) reports that domestic weekday newspaper circulation fell 8.7 percent over the past six months. Meanwhile, here in Colorado, the Denver Post reported a 10.2 percent weekday circulation decline over a year ago, which now puts it as the nation’s 14th largest newspaper in terms of weekday circulation. Of course, that is not exactly how Aldo Svaldi’s Denver Post article this morning described it. Before running across the word “bankruptcy” for the first time in the third paragraph, it was described as a “pact,” “deal,” “new ownership structure,” “restructuring plan” and “agreement.” Clearly there is no need to buy Svaldi a thesaurus for his birthday this year. Of the bankruptcy agreement, Media News chairman and chief executive William Dean Singleton said, “It gives us one of the strongest balance sheets in the industry.” Sadly, he may be right. If you are interested, the Denver Business Journal also covered the Post’s bankruptcy agreement. “America’s oldest journal covering the newspaper industry” realizes the same fate of so many newspapers it covered. The Wall Street Journal has passed USA Today as the most-subscribed newspaper in the U.S. Unfortunately, the WSJ nabbed the honor only after USA Today raised its newstand price 33 percent saw a resulting 17 percent decline in circulation.